These two psychologists were virtually twinned together for more than a decade and performed ground-breaking work which is considered foundational to behavioural economics. Kahneman was awarded the 2002 Nobel Prize in Economics and, given that this isn’t awarded posthumously, he made clear on receiving the honour that it belonged to both of them. 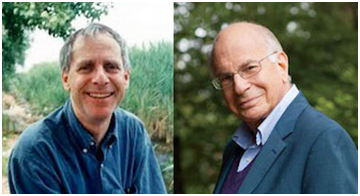 Tversky (pictured on the left) and Kahneman (on the right) were concerned with studying the mind, and its processes. In particular, they examined situations in which we apparently depart from making rational decisions and theorised as to why this is so. Their work focused on judgements and decision-making and, by establishing reasoning behind common human errors, challenged the assumption of human rationality that is the basis of much economic theory. I would point you back to Deming and note that one of his quadrants of ‘Profound Knowledge’ is understanding human psychology…if we don’t understand what we (and those around us) do and why then we are going to really struggle to affect meaningful change towards our purpose. Kahneman put much of his (and Tversky’s) life works together into an amazing (mind-bending) book called ‘Thinking Fast and Slow’ (2011)* that walks through how our brains actually work, the core set of cognitive heuristics, biases and fallacies that we are susceptible to, and how we make (emotional) choices. The Economist wrote the following of the book: “As Copernicus removed the earth from the centre of the universe and Darwin knocked humans off their biological perch, Kahneman has shown that we are not the paragons of reason we assume ourselves to be”…and, yes, I believe it is a pretty significant book. I’ve been reading books on ‘irrationality’ and ‘behavioural economics’ for a number of years now and I was curious to go back to them to see how they compared. What I found surprised me: It turns out that all the books I had previously read were based on much of Tversky and Kahneman’s work – their research papers were splattered throughout the reference sections at the back of these books. This qualifies them (at least with me) for ‘giant’ status. please live with the potentially un-PC wording in the animation narrator’s script re. getting pregnant. It is clearly delivered from a male’s point of view…but it still makes sense. Both Tversky and Kahneman collaborated with many other leading researchers. Richard Thaler stands out as being particularly noteworthy. Thaler is a co-author of the book called ‘Nudge’, which Kahneman describes as “the basic manual for applying behavioural economics to policy”. And it was Kahneman who persuaded Dan Ariely to take the direction that has led to him becoming such a respected behavioural economist (and being one of the most watched TED speakers).